Our Puppies Have Become Members of Wonderful Families! Jazz and Max's Litter born December 15, 2008: You can go to the Sharing the Fun page to see these puppies as they are growing. Sunny went home with Warren and Leann Henry of Toledo. Ruben went home with Scot and Lisa Friedman near Cincinnati. Minnie went home with Caroline Kerns of Connecticut. Zuko went home with Joe and Kim Madlener of Cincinnati. Nellie went home with Lou Sharpshair of Cincinnati. I'm sorry to say that the pictures of the families who took our first litter between Jazz and Jefferson were lost, but those puppies went to: nearby towns of Fort Wayne, Toledo, and Van Wert, and two went farther away to Chicago and Michigan. I went to visit "Bling" who lives in Fort Wayne, Indiana with his owner, Anna Brackmann. Bling was the largest apricot male puppy from Jazz's first litter with Jefferson and a brother to Cedar. He is two years old in this picture and a very big handsome boy, weighing 72 pounds! We so enjoyed seeing him again and playing with him. Below is a letter I received from Anna before we made a date to visit Bling. Enjoy more pictures of Bling on the Sharing the Fun page under Jazz and Jefferson's litter. I've been thinking about you since my Bling (your Blaze) celebrated his birthday on the 13th. Bling is a wonderful, beautiful boy who looks like his mother as you predicted. He is a big, well muscled lap dog. He is an excellent watch dog but makes friends quickly. he loves to play with other dogs, but jumps on my lap if even tiny dogs growl or get rough. He misses Travis my old Samoyed whom we lost in June. They were such good pals. Bling learned to play gently with Travis. I really consider Bling a gift from God. He is a wonderful companion who loves to retrieve and follows me from room to room. He is interested in every thing I do and notices everything. for example, after "helping" me decorate for Christmas he walked around the rooms looking at everything like he was in an art gallery! Everyone loves him! He is so much fun! he is beautiful and healthy and has never been sick in spite of stealing people food as he trained me that the top of the frig was the only place he can't reach! He likes to be groomed and loves his groomer. He expects to be brushed at least every day. He is SO smart and understands a lot of words and phrases. I enjoyed your on line site so much! your descriptions of your dogs sounds SO familiar! The puppies are all beautiful as is Bling's sister! You do a wonderful job with your puppies having them right with you from birth. I knew Bling would be a good dog when I came into your house! Thank you for having my Bling! Jazz and Max's Litter born October 22, 2009: You can go to the Sharing the Fun page to see these puppies as they are growing. "Rigsby" went home with Mary Ellen Hamm from Penn Yan, NY. 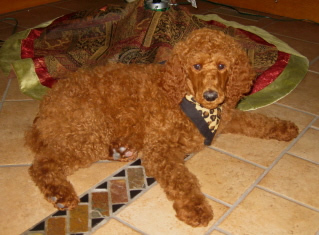 "Bo" went home with Jerry and Andrea Pienta from Canton, GE. 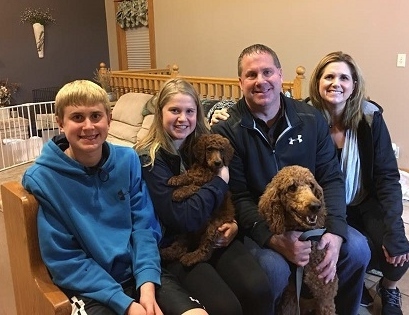 "Holly" and "Ike" went home with the Puthenpurayil family from Pittsburgh, PA.
"Harkin" went home with Craig and Erin Haran to Brecksville, OH. "Eli" went home with Sandra Kay and Nelson Garrett to Newport News, VA.
"Leo" went home with Bill and Liz Temple from Loveland, OH. 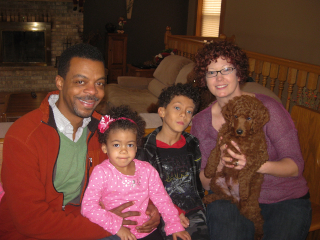 "Reggie" went home with Jon and Lisa Didier and their five children to Fort Wayne, IN. Cedar and Max's Litter born October 28, 2009: You can go to the Sharing the Fun page to see these puppies as they are growing. 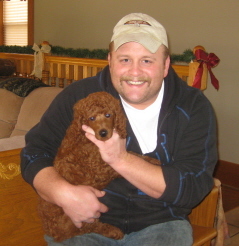 "Cali" went home with Chad and Kathryn Hartwig to Walworth, WI. "Mustang" went home with Sara Shepard from Dublin, OH. "Thule" went home with Jan MacDonald to Syracuse, NY. "Kaylee" went home with Tom Rosebrock to Hicksville, OH. Cedar and Max's Litter born November 1, 2010: You can go to the Sharing the Fun page to see these puppies as they are growing. "Cooper" went with Don Karr from Lake Mary, FL. "Cocoa" went home with Pat Wheat-Martin of Deleware, OH. "Ruby went home with Mr. and Mrs. Ratliff from Flatwoods, KY.
Jazz and Max's Litter born January 29, 2011: You can go to the Sharing the Fun page to see these puppies as they are growing. "Mazie" went home with Ty and Michelle Zabel and their son Jamie to Dayton, OH. "Niko", went home with Lisa Smiley and her three children, Breanna, Joshua, and Melina, to Clarksville, Tennessee. "Ruskin", went home with David and Katie Eviston to Fairborn, OH. "Maggie" went home with Don and Garnett Smith,as well as Garrett and Amber to Plain City, OH. "Lucia" went to Hamilton, Ohio with the Hoover family: (L to R)Shawna, Alivia, Tyler, Scot and Evan. "Lucy" went home with Victoria Meshekow to Medina, Ohio. "Maple" went home with Don and Emily Iles, and their children, Anna, Evan, and Neal, to Wadsworth, Ohio. Cedar and Max's Litter born November 25, 2011: You can go to the Sharing the Fun page to see these puppies as they are growing. "Ivy," went home with Tom and Sue Doan from Oakland, Michigan. "Gus," went home with Janice Sauris from Columbus, Ohio. "Amos," went home with Tyler and Karla Wagner from Greenfield, Ohio. "Pisgah," went home with Adam Poss and Tiffany Lane from near Portland, Oregon. "Sedona," went home with Jenny Kershaw from Westlake, Ohio. "Kerra," went home with Lisa Steffes from Muskegon, Michigan. "Lola," went home with Darrin and Stephanie Wasniewski and their three children from Orrville, Ohio. "Katniss," went home with Melissa McNeal and her children from Streetsborro, OH. Jazz and Max's Litter born November 28, 2011: You can go to the Sharing the Fun page to see these puppies as they are growing. 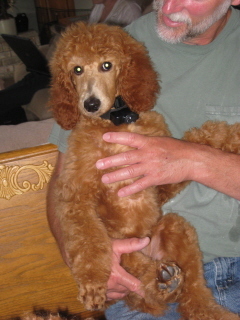 "Charlie," went home with Rick and Lynn Sellers from Centerville, Ohio. "Ethel," went home with Dorothy Griffiths from Ada, OH. "Scarlett," went home with Kevin and Ashlee Grayson, and their two boys, Noah and Matthew, from West Chester, Ohio. "Luna," went home with Jon and Laura Majorowski from Swanton, Ohio. "Raspberry Woods Glowing Ember," went home with the Coyne family from Payne, Ohio. Gracie and Max's Litter born October 14, 2012: You can go to the Sharing the Fun page to see these puppies as they are growing. "Nikita" went home with Seth and Kate Berman to Holly Springs, NC. "Pipa" went home with Phil and Anna Hood to Akron, Ohio. "Rory" went home with Mike and Candy Kennedy to Erie, PA.
"Tiffany" went home with Paula and Kyllee Berry to Grove City, Ohio. 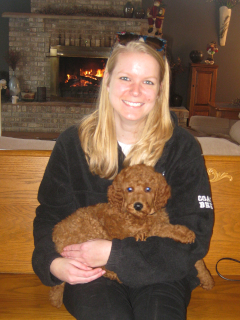 "Toews" went home with Jaclyn Harrinton and James Beer to Dublin, Ohio. "Clifford" went home with Denise Skevington and her family to Dayton, Ohio. "Brandy" went home with Bill and Donna Powell to New Port Richey, Florida. "Louis" went home with Chuch and Lisa Prudhomme along with Henry, Elisabeth, George and Catherine to Kalamazoo, MI. "Frankie" went home with Mandy Peterson to St. Petersburg, Florida. Cedar and Max's Litter born October 17, 2012: You can go to the Sharing the Fun page to see these puppies as they are growing. 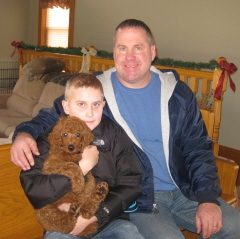 "Bentley" went home with Todd and Lisa Denlinger and their family to Kettering, Ohio. "Rosco" went home with Tim and Samara Calvin to Bryan, Ohio. "Hoosier" went home with Rachel McWaters and Alfonso Lerma to Indianapolis, Indiana. "Henry" went home with Tyler and Karla Wagner and Henry's big brother, Amos, to Greenfield, Ohio. "Della" went home with Jared and Nan Namenson to Kettering, Ohio. "Jingle" went home with Linda Lonsinger to Sugar Grove, Ohio. Jazz and Preston's Litter born February 25, 2013: You can go to the Sharing the Fun page to see these puppies as they are growing. "Liam" went home with Laura and Neal Gray to Tippecanoe, Ohio. "Oliver" went home with John and Shannon Mraz to Brecksville, Ohio. "Charlie" went home with Renee Lewis and her children to Fort Wayne, Indiana. "Abby" went home with Rick and Sue Martin to Blacklick, Ohio. Cedar and Max's Last Litter born October 2, 2013: You can go to the Sharing the Fun page to see these puppies as they are growing. "Jillian" went home with Jim and Mary Ferguson to Findlay, Ohio. 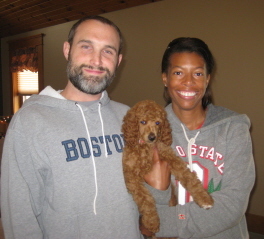 "Sunny" went home with Cheryl, Warren and Carey to Ottawa Hills, Ohio. "Topper" went home with Dave and Beth Brown and their children Kayla and Kyle to Chardon, Ohio. "Lucy" went home with Sam and Chris Glaviano and daughter, Sara, to Westerville, Ohio. "Daphne" went home with Julie and Andrew Thomas and their four children, James, Aristidis, Chris and Maria, to New Baltimore, Michigan. 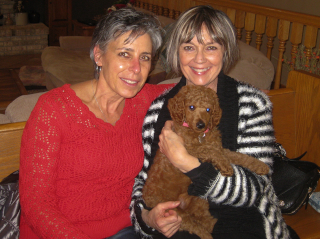 "Georgette," went home with Amanda and Natalie Walker to Alpine, Utah. Gracie and Max's Second Litter born October 13, 2013: You can go to the Sharing the Fun page to see these puppies as they are growing. "Neville" went home with Reid McDowell and Jessy White to Indianapolis, Indiana. "Kimi " went home with Andrew and Brigitte Beer to Dublin, Ohio. "Cosmo" went home with Scott and Cheri Lohrey and their children to Mentor, Ohio. "Winston" went home with Dena Kamen to Huntingburg, Indiana. "Sophia" went home with Toni, Turk to Lancaster, Ohio. 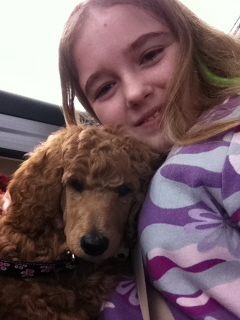 "Bria" went home with Cindy Casto and her family to London, Ohio. 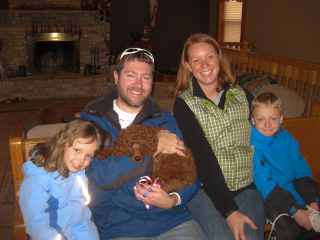 "Roxy" went home with Bret and Jenny Johnson and their family to Upper Artlington, OH. Ellie Mae stayed with us! Sophia and Max's First Litter born November 4, 2014: You can go to the Sharing the Fun page to see these puppies as they are growing. "Leo" went home with Bob and Nancy Lane to Skaneateles, New York. "Fiona" went home with Jacob and Mary Beatty to Pataskala, Ohio. "Finnick" went home with Doug, Linda and Autumn Zak to Middlefield, Ohio. "Jack" went home with Paul, Jeanne and Danny Trexler to Columbus, Ohio. "Felix" went home with Mark Lugibihl to Lima, Ohio. "Scarlett" went home with Nancy Sponseller to Dublin, Ohio. 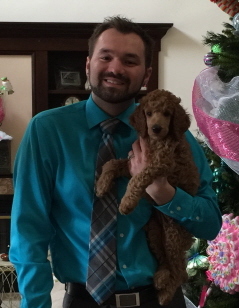 "Lucy" went home with Ryan and Amber Morris and children to Fishers, Indiana. Gracie and Max's Third Litter born November 24, 2014: You can go to the Sharing the Fun page to see these puppies as they are growing. "Rooney" went home with David and Patsy Stein to Lima, Ohio. "Bettylou" went home with Marcia Gastaldo to Columbus, Ohio. "Boone" went home with Jaclyn Harrington and James Beer to Dublin, Ohio. They also own Toews from Gracie and Max's first litter. 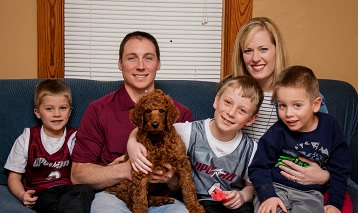 "Marshall" went home with Jay and Katie White and their children to Columbus, Ohio. "Lucy" went home with Celene Fizgerald and her family to Homer Glen, Illinois. "Finnian" went home with Mark and Fran Bluhm to Lakewood, Ohio. "Gibson" stayed in the family with Andrew and Julie Emerine and our three grandsons, Caleb, Keston and Eli! Sophia and Max's Third Litter Born October 22, 2015: You can go to the Sharing the Fun page to see these puppies as they are growing. "Harlow" went home with Shawnean Wallace to Canadian, Texas. 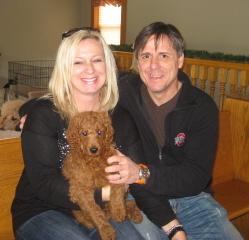 "Ruben," went home with Jeffery and Debbie Lewis to Cedarville, OH. "Aoife," went home with Lisa Steffes to North Muskegon, MI. Lisa also owns Kerra from a Cedar/Max litter. "Riggins," went home with Ron, Wendy and Aiden Kingston to Cridersville, OH. 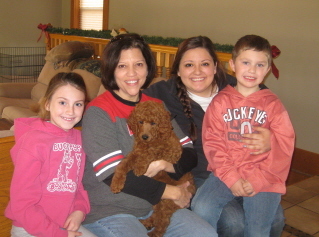 "Luke," went home with Karern Caserta and her family to Dublin, OH. "Rembrant," went home with Dan and Judith Goronzy to Dublin, OH. "Clifford," went home with Kevin and Lizanne Mulligan to Cincinnati, OH. "Oakley," went home with Evan Iles and Daniell Ross to Troy, Ohio. "Annie," went home with Mark and Joyce Waltz to Port Clinton, Ohio. "Bitzy," went home with Erin Evans to Bloomington, Indiana. 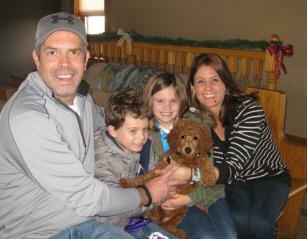 "Teddy," went home with Andrew and Nikki Hamons to Marblehead, Ohio. "Daphne," went home with Amy and John Ruggiero and their children to Spring Valley, Ohio. 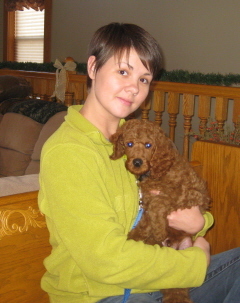 "Fiona," went home with Stephen Moberg and his family to Springfield, Ohio. "Emma Rose," went home with Phil and Brenda Horner to Lebanon, Ohio. "Alfred," went home with Sam and Amy Krouse to Brooklyn, New York. "Wiley," went home with Jerry and Chris Zawikowski to West Allis, Wisconsin. "Steve," went home with Deanne Reed to Westerville, Ohio. 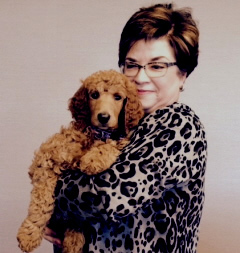 "Gracie Mae," went home with Kathleen Major to Homer Glen, Illinois. 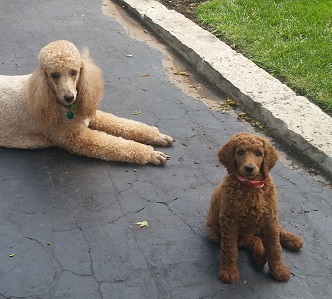 "Molly," went home with Bob and Candace Bauer and is pictured here with their older and very beautiful apricot poodle, Meggie. 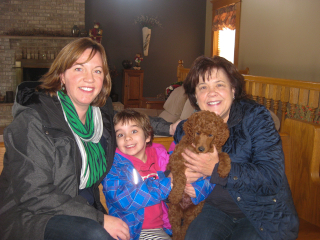 "Lucy," went home with Alycin and Mike Baser and family to Mokena, IL. Pictured: Karen, Guy and Alycin. "Tilly," went home with Paul and Candy Craven to Annapolis, MD. 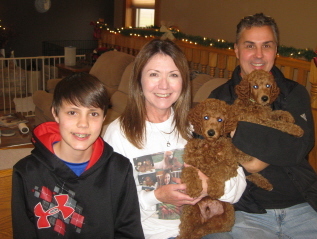 "Wrigley," went home with Matt and Stacy Fitzgibbon and children, Graham, Kate and Reid, to Loveland, OH. 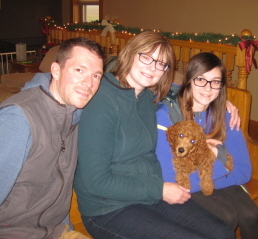 "Archie," went home with Chad and Linsie Lee to Mentor, OH. "Leo," went home with Alex, Ayrn, Scot and Cheri Lohrey to Mentor, OH. They also own Cosmo from Gracie and Max's second litter. "Boo, " went home with Tina Dostal and her son, Rayne, to Junction City, WI. "Ranger," went home with Jennifer Jarzab, Isaiah, Jacob, Anna and Janelle to Franklin, PA.
"Gertie," went home with Michael and Susan Cefalo to Jenkins Twp., PA.
"Wallace," went home with Jordan and Vilija Zandi to Westfield, IN. "Abby," went home with John and Justine Clemens to Pittsburgh, PA.
"Ginger," went home with Susan Meiling to Columbus, OH. "Louie," went home with Danny, Jeanne and Paul Trexler to Columbus, OH. They also own Jack from Sophia and Max's first litter. "Wendell, " went home with Mark and Bev Krajewski to Shepherdsville, KY.
"Flynn," went home with Bob and Teresa Behnke and daughter, Haylie, to Grove City, OH. 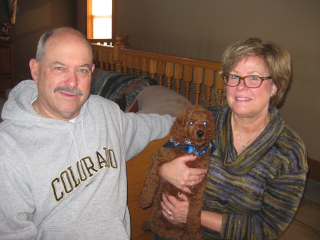 "Jasper," went home with Larry and Kathleen Lohr to N. Olmsted, OH. "Falco," went home with Elise Woolley to Columbus, OH. "Shiloh," went with Elspeth Neville to Lima, OH. "Susie," went with Dennis and Karen Franze to Mokena, IL. "Ace," went home with Randy and Tami Stout to Jamestown, OH. "Clovis," went home with Frank and Stacy Fairman to Punxsutawney, PA.
"Axl," went home with Tim and Samara Calvin to Brian, OH. They also own Rosco from our Cedar and Max. "Ajax," went home with Shane Price and his family to Wadsworth, OH. 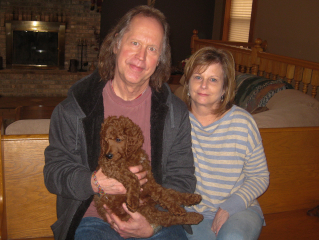 "Reggie," went home with Bob and Debbie Fink to Riverwoods, IL. 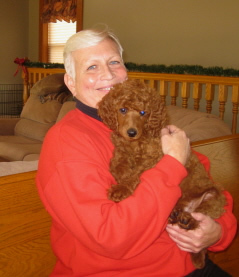 "Azalea or (Azzy)," went home with Fred and Vicki Stroll to Sylvania, OH. 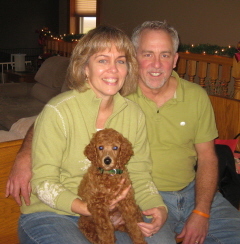 "Ruby," went home with Mike and Teresa Kettwig and family to Frankfort, IL. "Gabe," went home with Brian Campbell and Dan Kelly to Powell, OH. Pink Collar "Molly" went home with Melanie Gumerman and Jon Tulk to Columbus, Ohio. Red Collar "Seve" went home with Linda Rodriguez to Los Gatos, California. Blue Collar "Mac" went home with Ken and Denise Collins to Aiken, South Carolina. Green Collar "Fineous" went home with Megan Ols to Cleveland, Ohio. Orange Collar "Rosy" went home with Jodi Yost to Toledo, Ohio. Black Collar "Remi" went home with Dave and Judy Jack to Palm Coast, Florida. Blue collar, Benelli, went home with Javier and Adriana Pena to Columbus, Ohio. Orange Collar, "Margo," went home with Luke and Katie Mosley to Cincinnati, Ohio! Pink Collar, "Poppy Moon," went home with Reeves family to Defiance, Ohio. Black Collar, "Sonny," went home with the Ahmed family to Hampton, Georgia. Red Collar, "Vera," went home with Sam and Mia Lee to Columbus, Ohio. Purple collar, "Ivy,"went home with Fitzgibbon family to Loveland, Ohio. Pictured at bottom left is Wrigley, their pup from Max and Gracie's 2016 litter. Green Collar, "Sassy," went home with Elise Lingenfelter to Loudonville, Ohio. Aqua Collar stayed with us and we named her Reba! "Willie James of RW," went home with Ronnie and Georgia (Tangi) Catipon to Columbus, Ohio. "Bob," went home with Laura Rosene to meet Patrick and Eric in Upper Arlington, Ohio. "Mazie," went home with Tom Rosebrock to Hicksville, Ohio. Tom also owns Kaylee, a pup from our Cedar and Max. "Ruby," went home with Anita Reusch to Harrison, Ohio. "Lucille," flew home with Deborah Garner and her son, Tom, to Gainsville, Georgia. "Duckie," went home with Linda and Karl Mattila to Medway, Ohio. 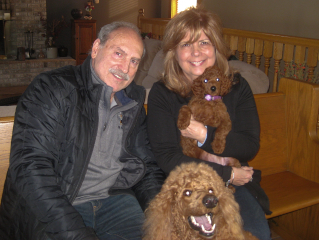 "Rosie," went home with Steve and Cher Garret to Glen Ellyn, Illinois. "Sutton," went home with Derek and Olivia Loucks to Wakarusa, Indiana. "Ember," went home with Felicity King, along with her parents and little brother, to Denton, Texas. "Layla," went home with Mark and Beth Wing to Grove City, Ohio.